If you prefer not to blend your own! 1lb. 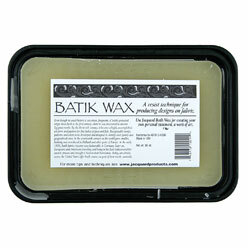 blocks of pre-mixed 50/50 combination of Paraffin and Sticky Wax for just the right "crackle" effect on your Batik. Melts at 150 degrees F.
Note: Batik Wax no longer comes in it's own foil tray, so you'll need something to melt it in, like a double boiler or some kind of electric pan with a temperature control. Remember, when working with any hot wax, to work in a very well ventilated area and never ever ever heat it hotter than 240º F! this is my technique for removing the wax from cotton shirts. Boil in water 2 minutes agitate remove rinse spot treat with iron + newsprint. I use this wax frequently and it has always been consistent. Good crackle - not too much not too little. Easy to work with. Odor was no issue for me. Easy to use no mixing no fuss! Very nice for me as a beginner. I did add a little paraffin to the mixture for a bit more crackle. I haven't done batik in years! We used to take our ironed but still waxy fabric to the dry cleaners to remove the rest of it. I used some failed dye experiments to play around and get a feel for using the wax. I used 12" wide strips of copper scrap to bend into a shape and threaded wire through 2 small holes to make a handle. This worked great to make a wax outline on the fabric and I filled them in using a chip brush. I used low immersion to dye the bundled panel with royal and wedgewood blue. (I actually did 3 different panels) A full day later I rinsed the fabric really well and got it barely damp dry by rolling in micro terry towels picked off any wax I could and ironed out as much of it as possible and then boiled it as suggested. I left out the ironing step with the other two panels- just boiled the panels- separately. I could see the wax rise as tiny bubbles and scooped them out as I mixed and they rose to the surface. I replaced some of the water that was removed with the wax with hot water and kept the fabric moving and lifting it up to pull it apart to get as much wax as I could. When there was only a couple of bubbles I lifted out the hot fabric and rinsed it over a bucket. The cool water solidified the surface wax and turned white and rinsed off the fabric easily. I reserved all the waterwax I had scooped out and from the final rinse and strained out the wax when it had cooled. I couldn't believe how much wax I was able to get out of it. The panel I ironed and then boiled was still stiff with wax after I washed all 3 panels. The 2 panels I only boiled came out baby soft without a hint of stiffness. I know this is a long review- edit as needed but wanted to share my results. I love the crackle effect from the wax- not too much not too little. And I couldn't be happier with the 3 failed dye experiments I used for my batik practice pieces. Loved the wax so much different that Gulf wax. Liked the product especially when you finalize your last wax application for batiking. Way less cracked wax falling off but left rice paper very texturized for final color. Definitely need a well ventilated area due to the offensive odor. Dharma always comes through with great products and service. This wax is no exception. I love you Dharma! Works great irons out clean. I was worried about having enough for the class. It would be jelpful to know approximately how much it would cover. Overall a good product. Goes on smooth and comes out with nice results. This is my first time trying Batik. I had no idea the technique was so temperature sensitive.